Scalability can fall in both financial and business strategyCorporate StrategyCorporate Strategy focuses on how to manage resources, risk and return across a firm, as opposed to looking at competitive advantages in business strategy contexts. In both cases, it stands for the ability of the entity to withstand pressure as a result of growth, and without being hindered by its resources or structure. 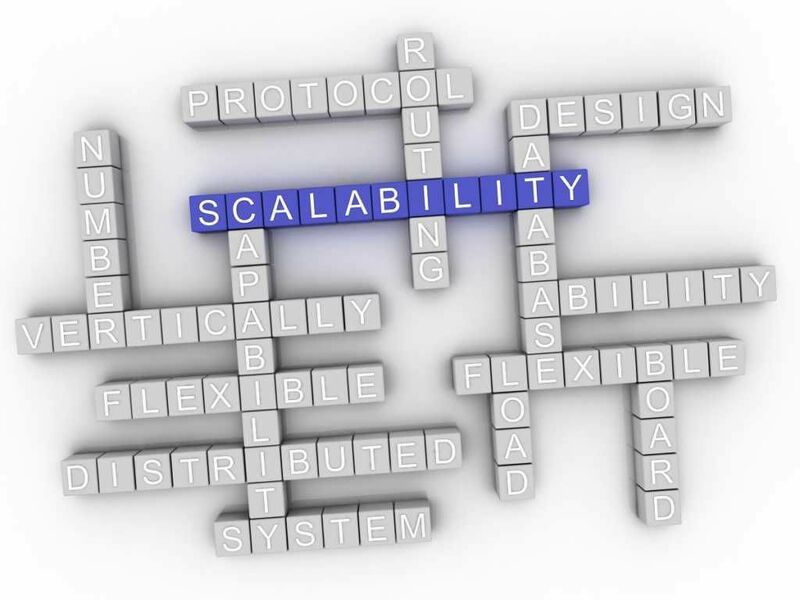 Scalability continues to gain popularity, especially following advancements in technology, which eases communication to customers and increases the efficiency of doing business. Does the profitabilityProfitability RatiosProfitability ratios are financial metrics used by analysts and investors to measure and evaluate the ability of a company to generate income (profit) relative to revenue, balance sheet assets, operating costs, and shareholders' equity during a specific period of time. They show how well a company utilizes its assets of the business increase, maintain or decrease? Does the business efficiency of doing business increase, maintain or decrease? It is the basis of the measure of scalability in any context whether financial or in corporations. As an entity increases the volume of its salesRevenue StreamsRevenue Streams are the money a business earns from the sale of goods or provision of services. The types of revenue that a business records on its accounts depend on the types of activities carried out by the business. Learn about the different types, how to categorize them and, it is a challenge to maintain or increase the level of efficiency and profitability. However, growth demands that these levels are maintained or raised for the stability of the business. Stakeholders in the business such as investors also long for the point of growth since it means more business and profits. Entities should thus set up scalable systems beforehand in anticipation of the point of growth. Those with scalable and flexible systems in place will easily withstand the pressure as a result of increased volumes without harming their profitability and efficiency in the process. Scalability and technology blend well and are inseparable for an efficient transition during growth. 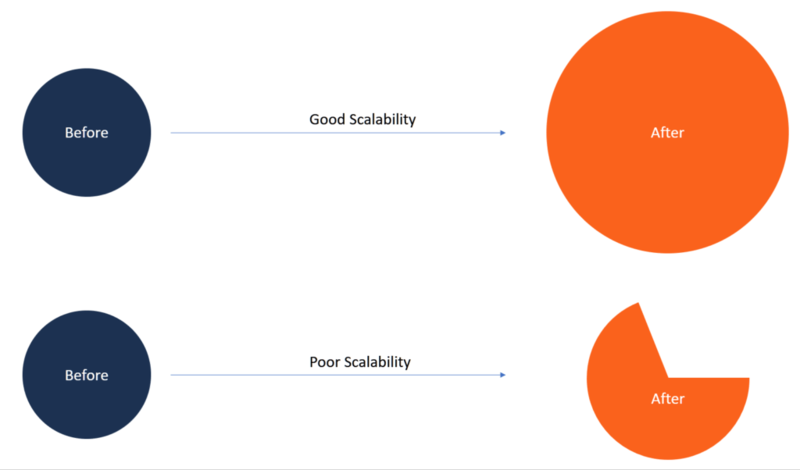 A system may be considered scalable if it can adapt to the changing needs or patterns of its users. It is often a sign of competitiveness because a scalable network or system is ready to handle increased demand, trends, and needs, even with the emergence of new competitors. Technology eases the process of scaling an entity. For instance, companies based on technology operations, i.e. information technology (IT) firms, find it easy to scale their processes. Since these companies are tech savvies, they see huge growth opportunities. The main reason for their ease of scaling is the fact that these companies keep less or no inventory while many of them also utilize the Software as a Service (SaaS) approach to dealing with stock. Other entities can incorporate technology into their operations to ease their work even as they plan to grow. Technology links businesses directly to the clients, especially in the advertising world where the digital platform makes advertisement easy and affordable even for small and medium-sized enterprises. It makes technology a powerful tool that can benefit even those enterprises that are not directly connected to technology. Therefore, technology becomes a necessity in every business, with many businesses incorporating an IT department in their enterprises. It provides a platform to increase the customer base through online advertisement and signups, with some business even opting to go entirely online without any physical stores. The financial sector continues to increase its online presence by investing in online banking where customers can enroll and transact without physically going to the bank. For a business to be scalable, it must focus on improving the profitability and efficiency of services even when its workload increases. The improvement of the profitability and the efficiency can only originate from the core of the business’ structure and workflow strategy. Scalability thus begins with the entity developing a set of leaders who run the operations with the necessary technical know-how. The leaders should understand their duties well and their respective hierarchies. All shareholders, including investors and advisors, should be involved in every part of the way as the strategy and direction of the entity is determined. The scalability of a business also depends on the effectiveness of communication whether internally to the workforce or externally to clients and investors. Consistency in brand messaging should persist as it helps the public understand and get persuaded into liking the product. Decreased brand messaging portrays a lack of passion or loss of persistence, which makes the company weaker among its competitors and less capable in terms of scalability. A good example of the lack of brand enforcement resulting in loss of scalability is Yahoo. The internet company lost grip on the market after an abrupt growth, which made it lose focus during its expansion, hence losing scalability. Scalable entities install sufficient tools for scaling evaluation. The tools facilitate the assessment and facilitation of scalability at every level. Therefore, the management of the business is eased, and the efficiency of operations increase significantly. Capital budgeting is also easy in a scalable business with the management and increased efficiency in operations in the entity. A scalable startupStartup Valuation Metrics (for internet companies)Startup Valuation Metrics for internet companies. This guide outlines the 17 most important e-commerce valuation metrics for internet starts to be valued is one that begins with a lucrative and innovative idea and adopts a profitable business model that can grow fast into a hugely profitable company. It includes entering a large market and creating a niche for themselves. They then pose significant competition to the incumbent businesses in the same industry and locality. The startups grow rapidly into huge, scalable, and profitable businesses despite its limited resources. Innovative startups aim at not only creating a product for the industry but also creating their industry for others to introduce products into it. Scalable startups can be seen from a mile away from the perspective of an experienced business in the same industry. The startups can receive multiple offers for buy-out due to their uniqueness. They aim to achieve growth beyond industry and competition from incumbents. They may seek assistance from banks or traditional financing for resources just like any other business. Scalable startups differ greatly from small businesses in the vision and model of the business even initially. Scalable businesses start small but grow rapidly over a short period, unlike a small business, which stagnates over a long time. A small business could be sufficiently paying the owner and other stakeholders, but a scalable business grows to dominate the market.